A new discovery...make's blog. , the winning blog for best craft for 2007! 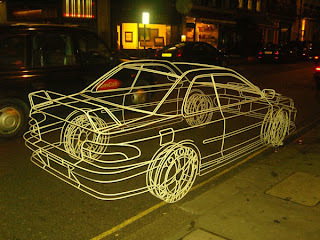 where I found today's posts on British artist Benedict Radcliffe who created this amazing, full-scale sculpture of a Subaru Impreza. It looks like a computer model overlayed on a street photo, but it's real, complete with Yokohama wire frame tires. Apparently local traffic cops weren't pleased that the art was parked outside of the gallery on the street, as over the course of a few days, it was issued a few parking tickets!